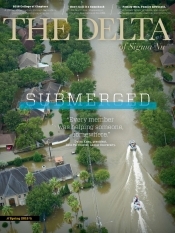 The Delta - v134n2 - Riding with the Cajun Navy - Sigma Nu Fraternity, Inc. If you followed the Hurricane Harvey stories on national media, you may have read about the so-called “Cajun Navy,” volunteers from Louisiana who hauled in their flatbed swamp boats and rescued thousands of stranded Houstonians. Alumnus Brian Laney (Houston) joined in the Cajun Navy’s rescues and documented the five-day experience. We recently sat down with Laney, who shared his story. You’re a native Houstonian, and Houston is prone to Hurricanes. You’ve been through major storms before. What sort of expectations did you have? Originally I didn’t have any concern. I only work from source news; I don’t follow the weather on lo­cal TV or cable. I rely on the Na­tional Weather Service, NOAA and Transtar [Harris county’s network of rain gauges, trans­portation and traffic camera system]. When I saw that it was getting bad, I [realized] it was going to be a big deal. Was your family directed affected? No, and that’s an enabling fac­tor. You know first responders, they have to go and help others no matter what condition their own situation is. We didn’t have that. 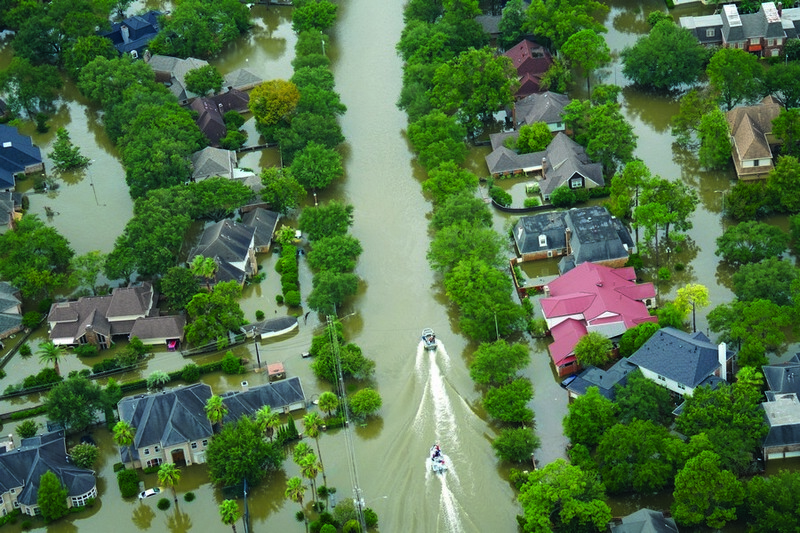 On the morning of Saturday, August 26, as Harvey swirled inland, the Greater Houston area – northeast of the Corpus Christi landfall site – began to experi­ence non-stop thunderstorms and a record 29 tornadoes. Es­pecially shocking was the path of one tornado skipping across Interstate 10 in the middle of Houston, completely obliterating an RV and boat storage facility where hundreds of recreation vehicles and watercrafts had been parked by their owners – as a precaution to Harvey. The National Weather Service office in Houston issued 156 tornado warnings throughout the first few days of Harvey. The next day the storm is stalled and just bringing all this rain in Houston. We live in Clear Lake [south of Houston near NASA] but we have a house under construction in the Houston Heights and I was staying there. I went to the local Walmart to check out what was happening because I’m interested in supply chain logistics, and there are just so many people waiting in the rain to get in line, having not prepared. [Laney and his fami­ly own a retail technology com­pany Alert Tech that is based in the Houston area.] I wanted to see how Walmart was handling the situation. I knew it wasn’t going to be good. Trucks can’t get in to restock stores, pretty soon there is going to be noth­ing, and for a while nobody can get in or out of these areas hit by the hurricane. Tell us about the rescues. On that Saturday things were looking pretty bad. There was a lot of destruction and the rain wasn’t stopping. Then on Sunday morning [August 27] I heard that Meyerland [an older well-to-do neighborhood in Southwest Houston] was total­ly under water. These homes were all flooded. People are posting all over social media and showing these bad situa­tions and it was like, what can I do? If you want to be helpful in a time of need, you need to be aware before it happens. My friend and I got together and we had a 16-foot canoe and a 30-foot Ford pickup F350. We were listening to Zello, which is an app that allows you to listen to first responders, and amateur radio, which is like emergency radio. It’s some­thing everyone should have and it was really essential. We were listening to emergency calls, and we heard about the fleets coming from Louisiana, the Cajun Navy. So after listen­ing we realized that Missouri City [a Houston suburb located in Fort Bend County] was in a really bad position, and we made our way there. What did you see in Missouri City? We went there, but there was no rescue infrastructure yet. After a few hours of standing around waiting on directions from Mis­souri City’s officials, we were like, “Hey, guys, we’re gonna just go see who needs help” and they were understanding. People were posting all over Facebook about needing help or giving addresses of people who needed help and other people were sharing phone numbers and saying, “Who can I help? I have a boat.” And that’s what we did too. My friend and I heard about another friend who was swept off the road near the Brazos River in Sealy. After finally making our way there and finding him, we were able to help him out. You know, this guy just had his truck completely flooded and was just in this terrible spot, but he wanted to help, he didn’t skip a beat. We pulled into a gas station in Fulshear, and some other guys were there, too. They said they were requested to go to a location at South Mason road and the Westpark Tollway in Katy, so that’s where we all went to help. We met this guy, Michael Stevens, who drove down from Midland to help out. He had this amazing custom flatbed boat that was perfect for nav­igating the floodwaters, and we ended up becoming good friends and helping out togeth­er. He slept at my house. How were rescue operations organized? At first they weren’t. The fire department was out there and working really hard to get to these people, but they have limited resources and they’re receiving a thousand phone calls from people asking for help. It was really shocking, there was so much water flood­ing this area. What sort of mindset were these people in that you were helping? Honestly many of these people were just in shock. They didn’t want to leave their homes. Nobody thought it would get to this point. There was one woman who we were helping out of her house, and she had a two-year-old and a garbage bag with diapers in it. That’s it. She was by herself. [Long pause.] I have a two-year-old. It was so up­setting. Many of these people were elderly or very frail and actually wouldn’t have been able to leave sooner. They could not leave without a lot of help. They needed assistance so this was their only option. Now they have literally lost everything. Their houses, cars, everything they owned. They couldn’t really bring anything with them. We were able to get a lot of people [10 or more] on that custom boat, we loaded it up completely. One woman who was a nurse was with us, she was trying to get her family. She had all these people in one house, I guess one part of the family left to be with another part of the family and so on, and then they had nowhere left to go. Like, this was her entire family. We also picked up a huge pig that was stuck and squealing trying to keep its head above water. This lady goes, “That’s my pig!” It was her daughter’s FFA pig that they kept because it couldn’t be auctioned off. So we also saved a pig. What sort of reactions were you getting from people? What happened to them when you dropped them off on dry land? I’m not sure what happened after we dropped them off. A lot of them had people coming for them, they just needed to be in a dry place where they could get picked up. I guess some went to shelters that were set up. How many rescues do you esti­mate that you helped with? We had 70 rescues the first day. And for the days following [August 28 and August 29] we had about 120 people that we were able to help. Earlier you mentioned other brothers helping in their own ways. Can you give me some examples of what they did? We were all texting each other regularly in group texts and updating each other. Nathan Larned (Houston), who is the assistant athletic director and football head at The Kinkaid School, he and others got together to gut 14 houses in two weeks. He organized a big team of volunteers. He had his students volunteering, too, which was good for them. Brian Shipley (Houston) was awesome, he was shopping for families. Brian North, Kent Miller, James Thorton, Daniel Solano (Houston) – they were all awesome. We worked together to clean out homes; others were helping with ani­mal shelter rescue. Some people run towards problems, I am one of those people. These guys all wanted to help people, if someone’s family needed help gutting houses or getting donations, they were helping. It was the definition of brotherhood.